Kerta Gosa Ancient Justice Court Palace is an ancient building designed with Balinese architecture that is an open house as jurisdiction place where the king announce the legislation, jurisdiction, penalization etc. Another interest places will be visit during Besakih Tour. It's very beautiful encircled by the fishpond with tropical plantations to add the artistic value that makes this place is good places to be visited. In its building roof, it is covered by full of ancient puppets picture. The uniqueness Kerta Gosa with Bale Kambang this is surface on the ceiling or roof bale is decorated with traditional painting style of Kamasan. 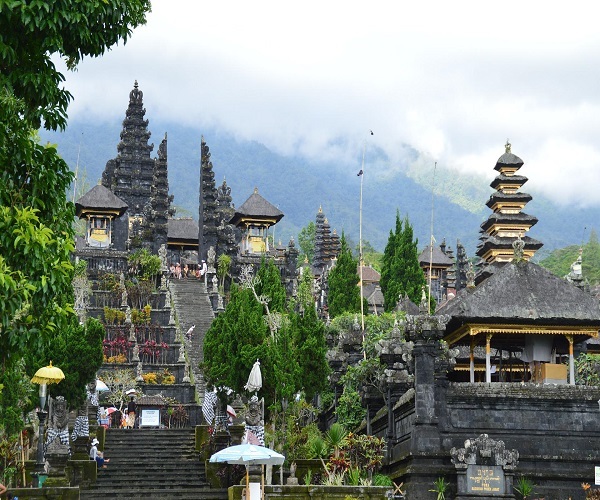 Known that since the 15th century, It was regarded as the central temple of Hinduism in Bali. Besakih Temple also known as Pura Penataran Agung, is Bali's main place of worship, a complex comprising twenty-two temples set on parallel ridges. Besakih Temple complex expresses the essential belief of the Balinese known as Tri Hita Kirana, meaning that life on earth must be lived and kept in balance and harmony between man and God, man and society and his fellow human beings, and man and his natural environment. The Besakih's name is come from the word of Basuki, the old language from Sanskrit Wasuki.